The Oceanarium Restaurant will feature a special lunch menu on Administrative Professionals Day on Wednesday, April 25. It’s a popular tradition at the Pacific Beach Hotel in Waikiki to prepare a scrumptious luncheon as a way for businesses to show appreciation to their administrative professionals. The highlight of this year’s menu could be sweets for the dessert lovers. For $15.95, indulge in a “Chocolate Dessert Fantasy,” an all-dessert lunch buffet featuring a chocolate fountain where you can dip long-stem strawberries, apple bananas, fresh pineapple, fresh melons, rice crispies, shortbread and snicker doodle cookies. Then, enjoy Champagne Sabayon Trifle, Tahitian Vanilla Panna Cotta, Fruit Tartlett, Lavender Palmiers, Almond Macaroon Cookies, Crème Brule, Chocolate Pralines, Marshmallow Pops, Tiramisu, Chocolate Decadence Cake, and Cheesecake Pops made of red velvet cake, carrot cake and chocolate truffle.Or choose a more traditional two-course menu: a choice of appetizer with King Crab and Langostino Chowder, or Island Mesclun Greens and Kauai Prawn Gazpacho Martini. 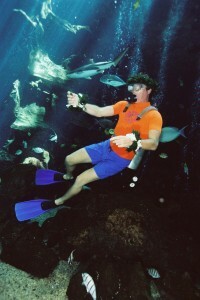 To make your lunch an unforgettable experience, have one of our divers carry a personalized thank you sign as they swim with the nearly 400 fish inside the Oceanarium. 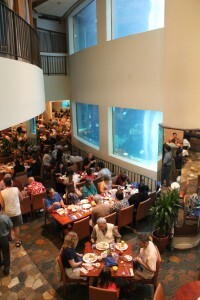 The restaurant boasts magnificent tableside views of the Oceanarium, so your employees will have a clear view. To add this personalized option, be sure to ask when you make your reservation. There is a charge, starting at $25, for the sign. 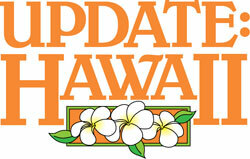 The luncheon special will be offered from 11:00 a.m. until 2:30 p.m. For reservations, please call (808) 921-6111. Validated self-parking is available. About the Pacific Beach HotelPart of the Hawaiian hospitality tradition since 1964, The Pacific Beach Hotel on the beach at Waikiki features the spectacular three-story indoor Oceanarium and restaurant and is locally owned and operated by HTH Corporation, which was founded in 1975 to consolidate the diverse Hawaii-based enterprises owned by H. T. Hayashi. Visit www.pacificbeachhotel.com and follow us on Facebook, www.facebook.com/PacificBeach Hotel, and on Twitter, @PacificBeachHtl.